Trick-Or-Treat! Halloween is one of my favorite holidays of the year. When you think of Halloween, you probably think of pumpkins, candy, costumes and the colors orange and black. This year, I want you to think of the color GREEN! Many Halloween products can produce a scary amount of waste that can haunt our world for many Halloween nights to come. Buy a green Halloween costume. When looking for a costume to buy at a store, leave behind the costumes that are made from non-recyclable plastic. Choose costumes that are made with natural materials, such as 100 percent cotton fabric, and face paint that is made without artificial dyes or other chemicals. Make your costume. Instead of buying your Halloween costume, make your own. Have your parents help you decide on one. Some popular costumes that are easy to make at home include a ghost, dog, cat, mouse, deck of cards, robot, car, princess or witch. Check out more DIY costume ideas here. Select eco-friendly Trick-or-Treat bags. Use a reusable or recyclable shopping bag, or a pillowcase. If you choose a plastic jack-o-lantern, just make sure you save it and reuse it next year. Party like an eco-star. If you’re going to have a Halloween party at your house, make sure to set out your recycling bins for all of the plastic cups, paper plates and soda cans. Or better yet, use reusable dishes! Cars are an important part of most daily routines. Whether your family car is new or old, big or small, there are ways to help protect the environment and improve gas mileage, which will save money. Purchase eco-friendly tires. Many name brand tire companies have developed eco-friendly tires that can reduce carbon emissions. Keep tires inflated. Under-inflated tires are less “round” and require more energy to begin moving and to maintain speed. Tire pressure should be checked at least monthly to get better mileage, reduce fuel costs and emissions. Get regular tune-ups. Car maintenance helps keep it running smoothly and can help boost gas mileage, which helps your family save money on gas by not having to fill up as often. Use the car wash. Washing your family’s car at home might seem like the greener option, but it’s actually one of the most environmentally unfriendly things you can do. Water that runs off the car can be loaded with gas, oil and residue that can be harmful to the environment. Encourage your parents to take the car to a local car wash instead. The car wash has special equipment to reduce the amount of water that’s used, and many of them recycle the water. Carpool. Another way to make your car more eco-friendly is to share it with others by carpooling with a friend or neighbor to school or other activities. If you want to hang out with me when I’m out and about, check my calendar to see which events I’ll be visiting next! Hopefully you’ve been keeping up with my blog posts, because I’ve shared lots of awesome tips and information with you over the past couple of years. If you think you’re an air quality rock star, take my quiz to see how much you know about the Sacramento region’s Spare The Air campaign! Which of the following IS NOT a great way to Spare The Air? What’s the name of the free app that your parents can download on their phones to check the daily air quality forecast and receive Spare The Air alerts? What do we call the PICTURE BELOW that helps us determine how much pollution is in the air? Except for wildfire smoke, what is the biggest cause of summertime air pollution in the Sacramento region? True or False: Children are at greater risk from air pollution because their lungs are still developing and they breathe more rapidly than adults, which increases their exposure. Riding a ________ or __________ to school are great ways to help Spare The Air. The Spare The Air season starts on ___________ and ends on _____________? Okay – let’s see how you did. Are you a Spare The Air expert? Scroll down to the bottom of the page to check your answers! If you want to say hello and hang out with me, check my calendar to see where my next stop is. Use a gas barbecue instead of a charcoal one. Using charcoal when barbecuing creates a lot of air pollution. Make sure to ask your parents to use a gas grill instead! Buy hot dog toppings that are locally grown. Hot dog toppings are endless. If you like tomatoes, onions, pickles…try buying toppings that are locally grown. When we buy local products, we help reduce air pollution because fewer trucks have to deliver food to our area from far away. If your parents decide that cooking just isn’t in the plans tonight, but you still want a hot dog – deals for National Hot Dog Day are happening all around. Ask your parents to take you out to a restaurant where you can get a hot dog! Walk, ride the bus or carpool to the store. If you are taking a trip to the store to purchase hot dogs to make at home, or you simply want to take advantage of the deals happening at local restaurants, try to get there using public transit or sharing a ride with a friend. The less we drive, the less we pollute the air! For more air quality information, browse my website, and don’t forget to ask your parents to download the FREE Sacramento Region Air Quality app. They can use the app to check the current air quality conditions in the area. Summer is here! School is out and many of you will go on vacation, head to summer camp or enjoy other outdoor activities that don’t require you to travel far. Despite all of the fun you’re going to have, it’s important to remember that CLEAN AIR IS UP TO US! Don’t forget to pay attention to air pollution levels and the Air Quality Index (AQI). Remember from my earlier post – the AQI is a chart that tells us if we can enjoy the outdoors as usual or if we should avoid any strenuous outdoor activities due to pollution levels being harmful to our health. Pack reusable items. Instead of buying travel size shampoo or conditioner switch to reusable containers for those things. Turn off the lights. Even if you’re staying at a hotel, turn off the lights and electronics when you aren’t using them. Even on vacation it’s important to save energy. Use reusable water bottles. Reusable water bottles are a great way to help the environment. Most places will have a FREE faucet or water fountain that you can use to refill your water bottle, so there’s no reason to go buy one at the store. Walk or bike. Cars release pollution into the air. Once you get to your destination – walk, bike or use the local public transit system to get around town. Recycle. Remember to toss your cans and bottles in the recycling bin, rather than the garbage bin. If you aren’t sure whether you should recycle a container or box, check the package for a recycling symbol. Don’t litter! Hold onto garbage until you find a trash can! You can do your part to save the environment by not throwing trash on the ground. For more air quality information, check out my website, and don’t forget to ask your parents to download the FREE Sacramento Region Air Quality app. They can use the app to check the daily air quality forecast and get current conditions at the air monitoring sites in our region. You can also check my calendar to see where I will be visiting next. Now that school is out for the summer, I know that many of you will be spending lots of time outside. Personally, this is my favorite time of year because I love spending time outdoors. One of my favorite hobbies is gardening with my family. We plant trees whenever we have a chance and water all of our plants only when necessary (that helps save water! ), which keeps them nice and healthy. Plants are important for the environment and provide clean air for us to breathe. As you may know, there are many “green” gardening tips and Earth-friendly ways to help Spare The Air in your neighborhood, and around your home and garden. Here are some of the ways my family and I help Spare The Air! Plant a tree. Trees provide us with clean air. Planting a tree is really easy. This tutorial will help you through the process. Start a compost pile. Compost is made when you take kitchen scraps, such as leftover fruits and vegetables you don’t finish from your meals, and put them in a pile or compost container in your yard. It then becomes nutrient-rich food for your soil and can be a great way to help your garden grow naturally! Water smartly. When you water your plants, try to be as efficient as possible. Water your plants and garden during the coolest part of the day, so most of the water has a chance to soak into the ground before it evaporates. Focus on each individual plant and give it a nice soak around the base. This will help the roots grow stronger – plus, more efficient watering means more water conservation, and that helps our planet too! Avoid using oil-based pesticides. If you’re currently using these chemicals, replace them with a water-based solution because it will contribute less to smog than an oil-based pesticide. Use electric instead of gas-powered tools. Switch to an electric mower or weed-whacker to help prevent pollution in the air. You’ll be making a positive impact on the environment and the air quality in your community. For more air quality information, check out my website, and don’t forget to ask your parents to download the FREE Sacramento Region Air Quality app. They can use the app to check the daily air quality forecast and get current conditions at the air monitoring sites in our region. For help downloading the app, click here to watch a short video. Remember, CLEAN AIR IS UP TO US! My name is Sophia and I’m Scooter’s friend. I’m excited to finally meet you all. Now that Spare The Air season is here, Scooter and I want to help you understand our most important tool that helps you know when air pollution is especially bad, and when you should avoid any strenuous outdoor activities. This tool is called the Air Quality Index, or AQI for short. Hazardous is 301 to 500. The entire population is more likely to experience serious health effects and should avoid all outdoor exertion. Very Unhealthy is 201 to 300. Everyone may experience more serious health effects and should avoid all outdoor exertion. Unhealthy is 151 to 200. Everyone may begin to experience some adverse health effects and should limit prolonged outdoor exertion. Members of the sensitive groups should avoid prolonged outdoor exertion. Unhealthy for Sensitive Groups is 101 to 150. People with heart and lung disease, older adults and children are at a greater risk and should limit prolonged outdoor exertion. Moderate is 51 to 100. People who have a unique sensitivity to air pollution should consider limiting prolonged outdoor exertion. Good is 0 to 50. No health impacts are expected when air quality is in this range. When the AQI is at this level, it means you can do a happy dance! You can play outside all day without having to worry about air pollution. My and Scooter’s favorite days are when the AQI chart is in the GREEN range! On a Spare The Air day, it’s up to us to remind our parents of ways to help reduce air pollution, such as reducing their driving (or not driving at all), carpooling or taking public transit. People with heart and lung disease, older adults and children are at a greater risk and should limit outdoor activities. For more air quality information, browse my website. And, don’t forget to ask your parents to download the FREE Sacramento Region Air Quality app. They can use the app to check the daily air quality forecast and get current conditions at the air monitoring sites in our region: http://www.aqmdscooter.com/index.php/videos/%E2%80%8E. You can also check Scooter’s calendar to see where he will be visiting next. 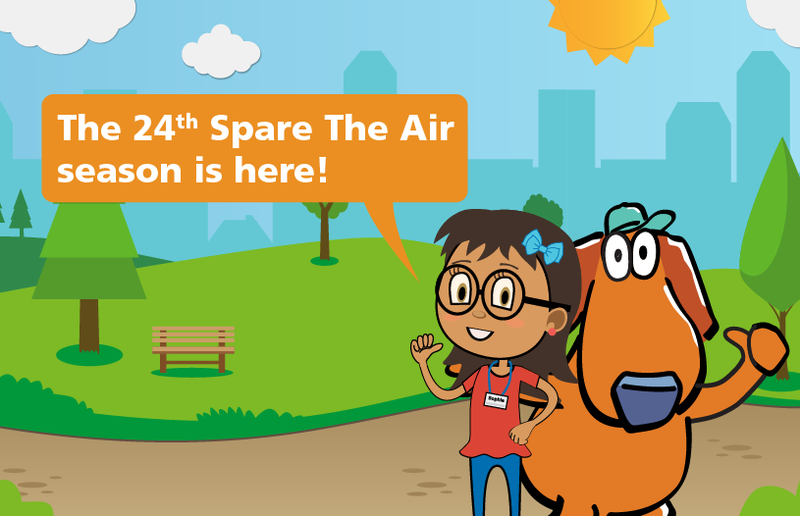 The 24th Spare The Air season is here. CLEAN AIR IS UP TO US! Between now and Halloween, we all need to help and do our part to reduce air pollution, especially smog. Together we can Spare The Air and make a big difference! Air pollution can cause health problems for everyone, but it’s even worse for kids! You see, children just like you are at a greater risk from air pollution because your lungs are still developing and you breathe more rapidly than adults, which increases your exposure. When air pollution reaches a certain level, a Spare The Air alert is sent out to let people know that air quality is going to be bad, so we can plan ahead. When you hear a Spare The Air alert, try to stay inside and avoid any strenuous outdoor activities, especially those that require a lot of running or those that make you feel really tired. For more air quality information, browse my website. You can also check my event calendar to see where I’ll be visiting next. 1. Walk or bike to school and after school activities: This is a great way to help keep the air clean and to get exercise. 2. Carpool to school, work and other activities: Share a ride with your friends. It’s fun and a great way to reduce air pollution. 3. Recycle: Always recycle when you can. Recycling is one of the easiest ways to help protect our planet Earth. Ask your parents to learn more by visiting calrecycle.ca.gov. 4. Turn off the lights: Save energy by using only what you need, and remember to turn off all the lights when you leave your house. 5. Don’t waste water: Always turn off the faucet while brushing your teeth to help save water. I hope you all had a wonderful and “green” Earth Day. I had a great time celebrating at the Placer County Earth Day event in Roseville, and the ECOS Earth Day event in Sacramento. To find out where I’ll be next, visit my event calendar.